Late this month, ESA’s Mars Express will make the closest flyby yet of the Red Planet’s largest moon Phobos, skimming past at only 45 km above its surface. The flyby on 29 December will be so close and fast that Mars Express will not be able to take any images, but instead it will yield the most accurate details yet of the moon’s gravitational field and, in turn, provide new details of its internal structure. As the spacecraft passes close to Phobos, it will be pulled slightly off course by the moon’s gravity, changing the spacecraft’s velocity by no more than a few centimetres per second. These small deviations will be reflected in the spacecraft’s radio signals as they are beamed back to Earth, and scientists can then translate them into measurements of the mass and density structure inside the moon. Earlier flybys, including the previous closest approach of 67 km in March 2010, have already suggested that the moon could be between a quarter and a third empty space – essentially a rubble pile with large spaces between the rocky blocks that make up the moon’s interior. Knowing the structure of the roughly 27 x 22 x 18 km Phobos will help to solve a big mystery concerning its origin and that of its more distant sibling, Deimos, which orbits Mars at approximately three times greater distance. The leading theories propose that the duo are either asteroids captured by Mars, or that they were born from debris thrown up from giant impacts on Mars. “By making close flybys of Phobos with Mars Express in this way, we can help to put constraints on the origin of these mysterious moons,” says Olivier Witasse, ESA’s Mars Express project scientist. In addition to probing the gravitational field of Phobos during its close approach, Mars Express will be making measurements of how the solar wind influences the moon’s surface. “At just 45 km from the surface, our spacecraft is passing almost within touching distance of Phobos,” says Michel Denis, Mars Express Operations Manager. Both the position of the spacecraft and the moon must be known to high precision in order to make the most accurate calculations of the moon’s internal characteristics. To improve the positional data, the spacecraft’s high-resolution stereo camera has been capturing images of Phobos set against the background star field in the weeks leading up to closest approach and will continue to do so afterwards. Furthermore, ground stations around the world will track the spacecraft for a total of 35 hours in the lead up to, during, and after the flyby to ensure that the position of Mars Express is precisely known. 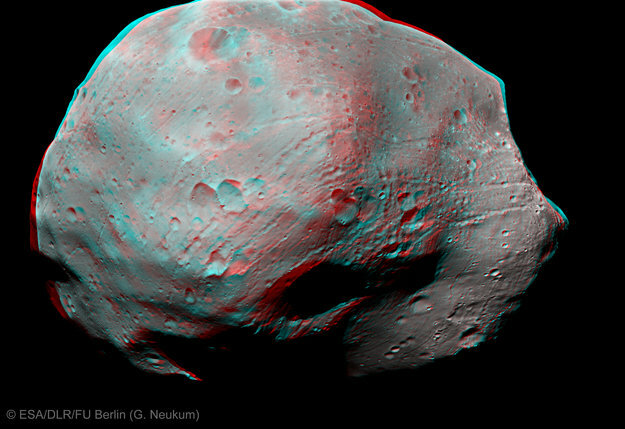 “Mars Express entered orbit around the Red Planet exactly ten years ago this week – this close flyby of Phobos is certainly an exciting way to celebrate!” adds Olivier. 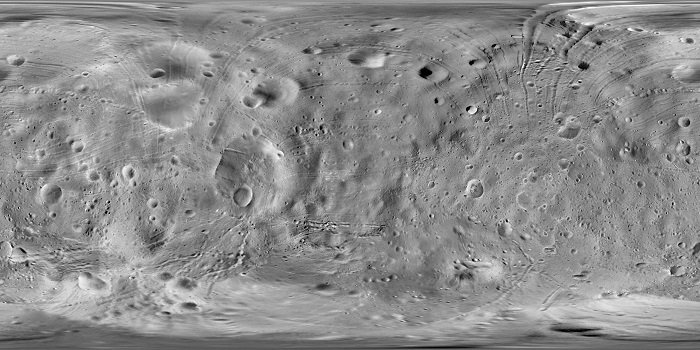 Mars Express HRSC (High Resolution Stereo Camera) image of Phobos taken on 9 January 2011 at a distance of 100 km with a resolution of 8.1 m/pixel. Use red-blue glasses to fully appreciate this image. Phobos is approximately 27 × 22 × 18 km and orbits Mars at a distance of 6000 km above the planet’s surface, or 9400 km from the centre of the planet. Am 29. Dezember wird Europas Mars Mission den kürzesten, je versuchten Vorbeiflug am Mars-Mond Phobos durchführen, nur 45 km an der Oberfläche vorbei. Das Vorbeiflugmanöver wird so nahe und schnell sein, dass die ESA-Sonde keine Bilder aufzeichnen, sondern stattdessen das Schwerefeld des Mondes sehr genau untersuchen wird. Dies soll wiederum neue Erkenntnisse zur inneren Struktur des seit langem von der Wissenschaft anvisierten Himmelskörpers liefern. Gesteuert wird Mars Express vom Europäischen Satellitenkontrollzentrum ESA/ESOC in Darmstadt. We are now transmitting from NASA's 70m deep-space station in Madrid, DSS-63, and have released ESA's 35m station at New Norcia. The hand-over between the two networks was very smooth with both DSN [NASA] and ESTRACK [ESA] performing their duties exactly on time despite an unusually tight schedule and a hand-over method that is not routinely used. The telemetry modulation was switched off again at 03:46GMT (04:46CET) and will remain off until shortly after we begin tracking with NASA's 70m station at Goldstone, California, DSS-14, at 11:23GMT (12:32CET). Until then we will be relying on a system that the NASA tracking stationcolleagues have very helpfully provided for us, in which we can monitor directly their spectrum analysers and check on the quality of the signal. 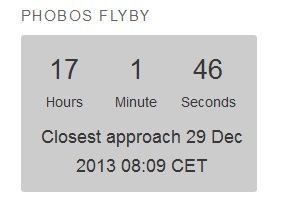 Everything is currently running as planned and the next event will be the fly-by itself! 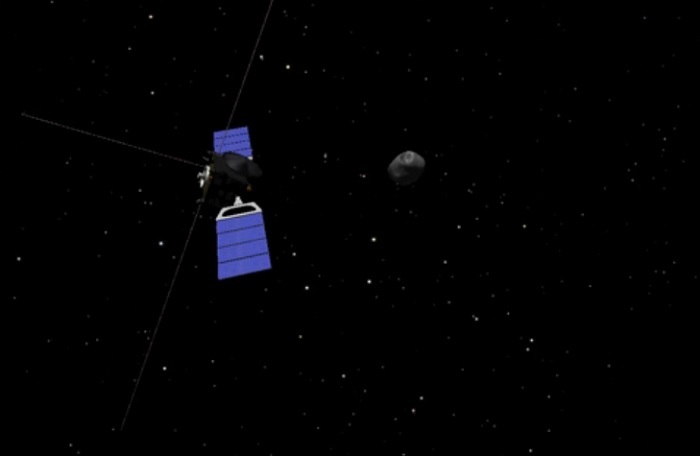 As you read this, at 08:09 CET, Mars Express will be making its closest-ever flyby of Phobos! MEX is transmitting a continuous radio signal across 208 million km of space, which is being tracked and received by NASA's 70m station at Madrid. The recording will enable scientists to precisely reconstruct the spacecraft's trajectory and, hence, know the gravitational influence of Phobos. The one-way signal time is 11 minutes, 35.4 seconds right now. If you were standing on the (lumpy) surface of Phobos and looked up, the animation below shows more or less what you would see: ESA's spacecraft as a pinpoint of light slowly but steadily advancing across the sky. A few minutes ago, I got an update from the Mars Express Dedicated Control Room at ESOC: everything is going as planned! The tracking today will continue through until this evening; NASA Goldstone takes over tracking at 11:02 GMT (12:02 CET) until 19:00 GMT (20:00 CET). ESA's New Norcia station will also shadow track starting at 17:06 GMT (18:06 CET). The MEX transmitter will remain on until tomorrow at 01:12 GMT (02:12 CET). Months of preparation have culminated in a successful and – As hoped for! – relatively quiet tracking and flyby operation. Best wishes and well done to the ESA and NASA pros who made this work. 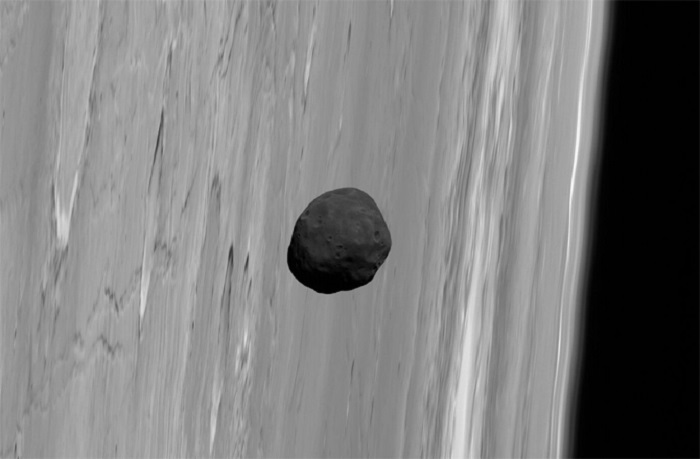 Phobos photographed by the ESA's Mars Express orbiter with Mars' limb in the background in 2010. On Sunday, at 5:17 p.m. GMT (12:17 p.m. EST), Europe’s Mars Express orbiter successfully completed a daring low-pass of Mars’ largest moon Phobos. In an effort to precisely measure the gravitational field of the moon, the 10 year-old mission was sent on a trajectory that took it only 45 kilometers (28 miles) from the dusty surface, the closest any spacecraft has ever come to the natural satellite. At the time of flyby, Mars Express was transmitting a “continuous radio signal across 208 million km of space” to NASA’s radio antennae near Madrid, Spain, wrote Daniel Scuka at ESA’s European Space Operations Centre, Darmstadt, Germany, in a blog update. The 70 meter radio antenna is part of NASA’s Deep Space Network (DSN), which precisely tracked the spacecraft’s signal. Post-flyby, NASA’s 70 meter Goldstone DSN antenna in the Mojave Desert, Calif., and ESA’s 35 meter antenna at New Norcia in Australia continued to track the mission. During the flyby, DSN operators reported “a slight effect in the Doppler residuals,” meaning that, as expected, Phobos’ gravity had accelerated Mars Express’ orbital velocity very slightly. Through careful analysis of the Doppler shifting of the radio signal, Phobos’ gravity can be measured, allowing scientists to discern its mass and density — the most precise measurement to date. All focus was on the spacecraft’s ability to send a continuous stream of data back to Earth, so close-up snapshots were not a possibility. However, the operation allowed the spacecraft to beam back an extra 200 Gigabits of observational data, including imagery of Phobos during an earlier 500 kilometer pass of the moon. The successful flyby marks the end of months of planning by the ESA team managing Mars Express that, as of last week, has been in Mars orbit for 10 years. This flyby opportunity will hopefully provide further clues to the origin of the knobbly 13.4 kilometer (8.3 mile) wide moon that orbits Mars only 6,000 kilometers (3,700 miles) from the planet’s surface. By precisely measuring the gravitational influence on a spacecraft during flyby, planetary scientists will better understand the moon’s composition. During previous flybys, scientists calculated that the moon must be one-third empty space, which means the object may be a “rubble pile” — an agglomeration of smaller rocks hold together under a mutual gravity. But did the material come from a cataclysmic Mars impact? 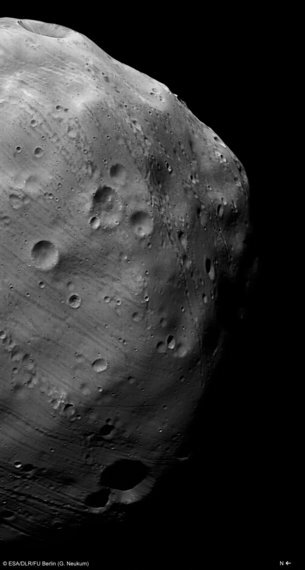 Or was Phobos, and its smaller satellite sibling Deimos, once an asteroid that got captured by Mars’ gravity? Those answers may not come until we can carry out a dedicated sample return mission of the moon’s regolith, but the flyby will certainly aid our understanding of Phobos’ internal structure.